1 jalapeno pepper, diced. Include the ribs & seeds if you like more heat. In a medium bowl, combine lime juice, cilantro, olive oil, and minced garlic. Skewer the shrimp and grill over high heat, about 2 minutes per side. Closely monitor to ensure they don't overcook. Shrimp will curl up and turn pearly/opaque when ready. 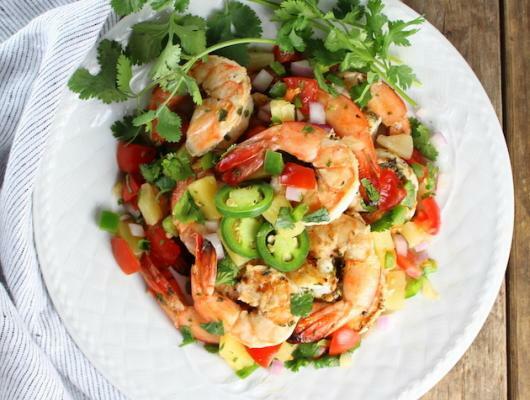 Squeeze fresh lime over shrimp then serve warm with pineapple salsa. Combine onion, pineapple, tomatoes, pineapple juice, jalapeno, and salt in a small serving bowl. If desired, adjust the seasoning to your preference by adding either more salt or more pineapple juice. Recipe Notes: Prep time includes 30 minute marinade time. 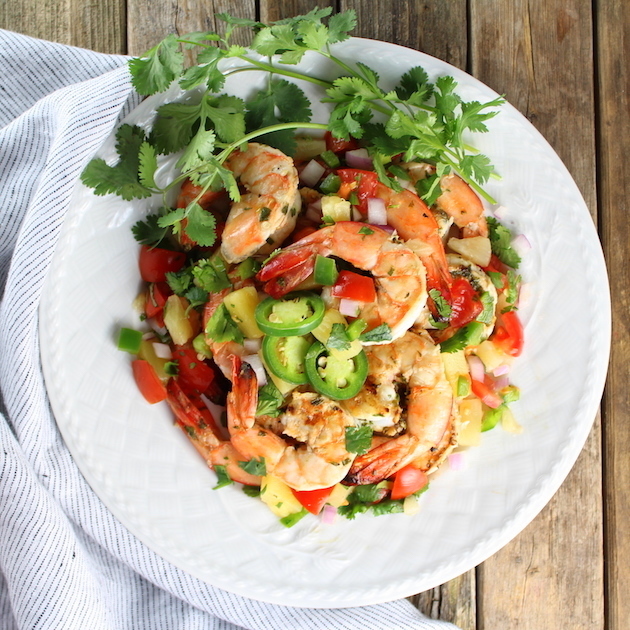 This Cilantro Lime Grilled #Shrimp with Pineapple Salsa is super-easy, & perfect for the grill! Cilantro, lime, & garlic marinade is balanced by sweet & zesty salsa with pineapple, jalapeno, red onion, tomatoes, & salt.